Saturday’s event on Cooleman Ridge will be both an ACT Metro Series & Junior League (#13) and an ACT League event (#10). The Assembly Area is near the corner of Perry Drive and Musgrove St Chapman. Parking: Parking will be in the streets of Chapman; more details are here. Please avoid parking where cycle lanes are identified on Perry Drive. Public Transport: The assembly area is next to a bus stop on the 926 route from Woden bus station. Toilets: The nearest public toilets are at Cooleman Court shopping centre in Weston Creek. Start and Finish: The Start and Finish are approximately 700 m south of registration; about five minutes at normal walking pace. The walk to the Start, beyond the end of Guinness Place, involves approximately 40 m of climb. Start Times. 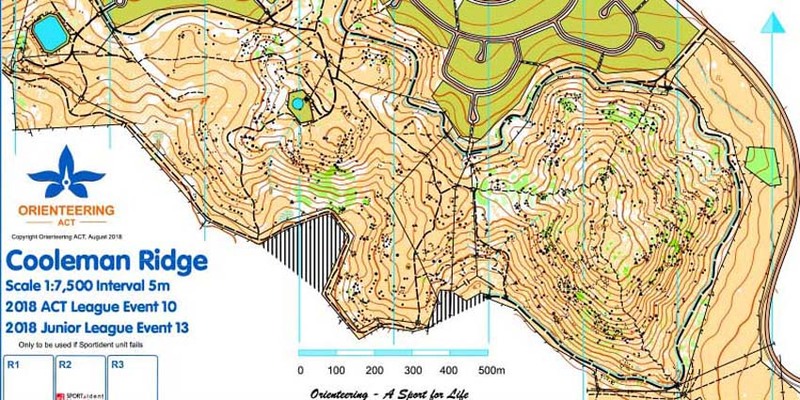 The ACT team to contest the Australian Schools Orienteering Championships in October will be using this event as practice for those Championships and will be starting at two-minute intervals from 10.00 am and no other competitors will be permitted to start before the last starter in the Schools team, which will be around 10.15 am. No maps will be available at the Assembly Area until 10.10 am when all the maps for all courses. There will be no blind starts for any courses. UNUSUAL HAZARD. There is an old telephone line in the area just to the west of Mt Arawang. In most places, the line is just above head height. In a number of places, it is at chest or head height. The Red 1, 2 and 3 courses pass underneath the telephone line. Competitors should take care in this area as the line is not always obvious. Map scale: The map scale for all courses is 1:7500. The slopes of Mt Arawang are steep. Courses Red 1, 2 and 3 visit this part of the map. Appropriate footwear is advisable. Other courses have been set so that it is mostly possible to avoid steep slopes. However, given the nature of Cooleman Ridge, all courses have above average climb. Some of the fences, while crossable, are not particularly friendly. Courses have been set so that there is a route with a gate option. The area has very many rocks. Note that only the bigger rocks have been mapped and there are many unmapped smaller rocks which are of a reasonable size. The vegetation has changed since the original mapping, but is generally similar to what is currently shown. The going is generally fast underfoot, but there are areas of “green” vegetation which can usually be avoided. There are wild raspberries in the area and full limb cover is recommended.